All new Pin Mate™ celebrating WONDER WOMAN™ and THE JUSTICE LEAGUE™. One-of-a-kind, retro-styled, miniature wooden figures. Number 19 in the series for true collectibility. Get ready to take on any challenges that comes your way with the Justice League Wonder Woman Pin Mate from Bif Bang Pow!. 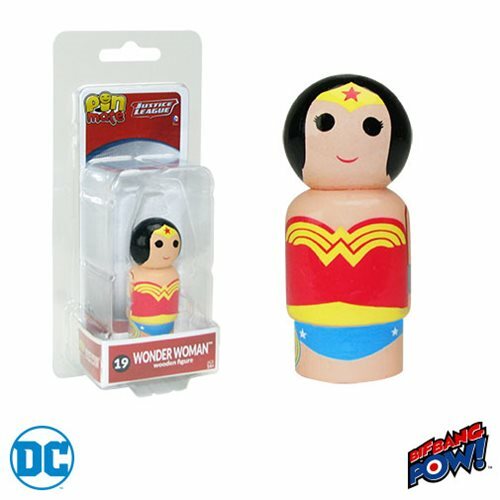 Designed in a retro-style, this pint-sized WONDER WOMAN™ wooden figure showcases the AMAZON WARRIOR PRINCESS™ with classic detailed 360-degree artwork that includes hand-painted details alongside limited decal graphics. Proving some of the best things do come in small packages, the Justice League Wonder Woman Pin Mate measures just 2-inches tall. Uniquely numbered on the bottom of the figure (as well as on the packaging), Justice League Wonder Woman Pin Mate secures its place as number 19 in the series for eternity. Ages 14 and up.